Hey guys, it's been a while. I've been super busy at work and haven't had much of a chance to work on personal artwork, but I figured I'd make a post about what I've been doing at my day job. If I haven't mentioned it before, I make cell phone games for a living. These days it's pretty much iPhone exclusively, which is simply an awesome platform to develop for compared to the traditional handset scene. We've released two games in the last month or so. Toy Bot Diaries and Shaky Summit (the links will take you to the iTunes App Store where you can buy the games if you've got an iPhone or iPod Touch). 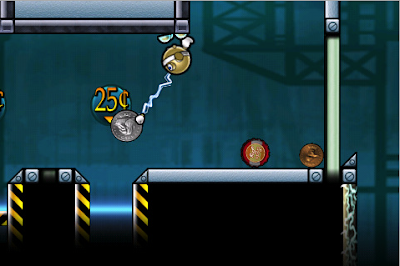 Toy Bot Diaries is a 2D platformer starring a tiny little robot who can stick to walls and grapple to metal objects. I was the lead artist as well as a level designer on the project. I created most of the game's art and half of the game's levels. There's a free demo if you want to try it out. There's more Toy Bot coming in the near future! Shaky Summit is a bit harder to explain. You're racing an opponent to the top of a mountain, but rather than controlling your player, you control the environment. 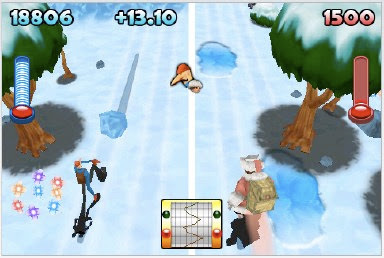 By causing the mountain to shake, you can activate hazards such as bridges and boulders to help yourself or hinder opponents. I was the texture artist on this project. For anyone out there with an iPhone or iPod Touch, I'd love for you to try the games out and tell me what you think. They're each less than $5, which is less than a cup of coffee, if you happen to drink really huge cups of coffee.